Al l the art of living lies in a fine mingling of letting go and holding on. Isn't back-to-school the perfect time for these wise words? But all summer I've been sending my husband off to work. Ever since we won the Body-for-LIFE Challenge (in 2000, 2nd runner-up in the couples division), Gino has known the importance of having healthy food with him at all times. Gino eats equal portions of protein and carbohydrates, about every 3 hours. Gino is not organized. He is the kind who will pivot on one foot for 15 seconds before realizing the thing he is looking for is upstairs. While he has a defined spot for his phone, wallet and keys, 1 out of 3 of these items is missing at any given time. ("Tami? Do you know where I put my keys?") For Gino, packing meals, especially in the morning, has to be easy, or it's not going to happen. I can tuck salad in the big compartment, dressing and steak (or chicken) into the smaller compartments. 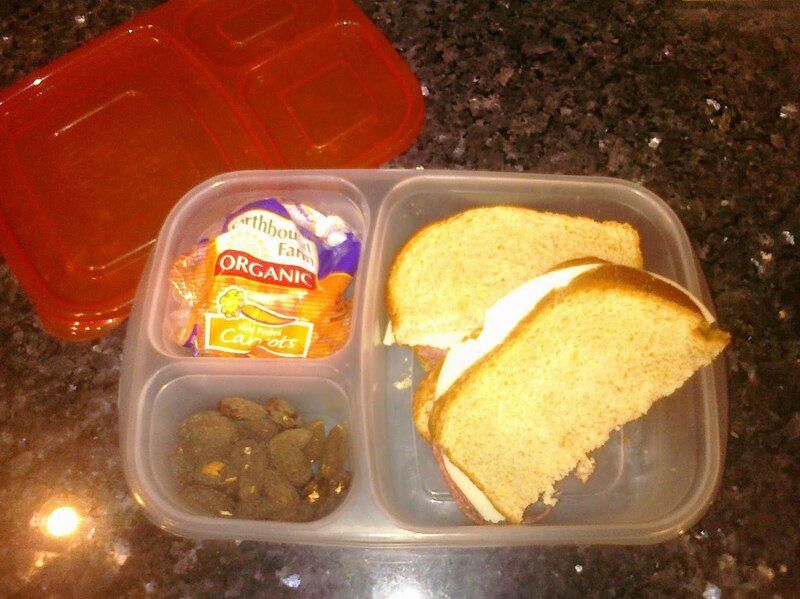 A sandwich fits nicely in the big compartment, baby carrots and a nuts or a bite-sized snickers fit in the smaller compartments. Leftovers are perfect for EasyLunchBoxes. 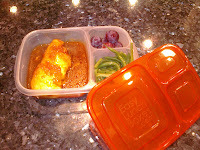 Chicken breast, including sauce, in the big compartment, a roll or rice in one small compartment, and veggies in other. In exchange for our honest review we were given a set of four containers with different colored lids ($14), and a cooler bag ($8). The cooler bag did a good job at keeping the containers upright. This seems to be important because the lids don't seem to seal as tightly as I'd expect. I never had any accidents, and the lids seem snug. But I don't hear that familiar "snap" I hear with other plastic containers. I place a small, flat ice pack in the bag under the food so it stays cool all day. I love that EasyLunchBoxes are dishwasher and microwave safe. Everything that wants to survive in my kitchen must also survive both of these climates or it's outta here. Speaking of microwave, since there are three compartments, it helps if all of your food requires the same amount of heat before eating. However, since this rarely happens, I use the individually-packaged snacks that can easily be pulled out and munched on while the main course is being heated up. Sometimes I place croûtons, nuts, grapes, crackers, etc. in a small plastic bag. Since kids don't heat up their lunches, this isn't as important as it is for adults who do. The packaging touts that "EasyLunchBoxes are made of non toxic, food safe polypropylene (PP). BPA, PVC & phthalate free." I know just enough to know that this is important, and that a few of you might gasp that I don't care more. I just say "Good to know," and give myself points for serving my family lunch in a manner that is smart, safe and healthy. EasyLunchBoxes lives up to its claim of making it just a bit easier to enjoy healthy food while you, or your kids, are on the go. They make school lunch preparation just a bit easier for parents sending their kids off to school. And for grown-ups, it beats the heck out of the "super-sized foods from drive-thru windows" habit! EasyLunchBoxes.com will give away a EasyLunchBox system to a randomly chosen winner. To enter, leave a comment below indicating which color cooler you would choose. To be considered, leave your comment by 11:59 pm (MDT) on September 1, 2010, and make sure we can get to your email address easily. US and Canada only, please. Random.org selected our winner, #4 -- Andrea Grace! Congratulations, Andrea. Your EasyLunchBox system will come directly from the company. I love your review of this product. We pack lunches for my hubby and one of my kids almost every day. It's awesome that there is an easy way to make it healthy too. P.S. The color I prefer would be Black (it's more "manly."). If it comes in a more "girly" color, then I guess I get to use it! YIPPEE!! These look great! I like the maroon one. Love all your reviews - I have tried several of the products you've recommended - but not the toe-y shoes, that wasn't me. But this lunchbox thing, I'll take a green one! mimi - you have my email.